I haven’t really touched the computer since the last post–crazy holiday madness, I guess. I’m so not into the Christmas nonsense, and it’s really not over yet. *sigh sigh sigh* I just don’t see the point in stressing out so much. If we struck out the obligatory gift giving, the obscenely grandiose dinners, and the expectation to spend time with folks we only see once a year for a reason… it could be great. Now don’t get me wrong, I don’t mind gift giving. I very much enjoy being able to provide someone I love with something s/he’ll love. It’s great to receive a well thought out gift. What’s not great, is stressing out over the necessity to purchase something by a certain date. For everyone. Then people get gifts they don’t want, won’t use, and will feel guilty returning. Of course there may be someone who gets you a gift and you didn’t plan on buying them anything, or you planned a smaller gift than they gave you. If you didn’t get something from me, don’t fret. I’d much rather send you a “Christmas” present in May because that’s when I found something that just screamed *you* than give you something in December because it’s December. As for the dinner, well, yeah, food is great. It’s nice to have something special sometimes. But going on 12 grocery runs in 3 days and cooking all day until you feel sick from the effort to please people whose opinions don’t even matter than much? Meh. And the people? Hey, I’m not anti-family, but sometimes it seems silly to let a holiday be spent with folks driving each other crazy. My proposal for a better holiday? Spend the time with people who make you feel good, not those who make you feel guilty for your absence. Exchange hugs instead of presents. Do something enjoyable, not something expected. One thing I do, however, love about everyone being involved in the madness of December 25 is traveling on Christmas day. It’s probably the most peaceful day in the whole year for air travel. This year, I flew from AUS to MCI via DFW. Security was a breeze, my flights were all on time, and to top it all off, I got a Christmas gift from the flight attendant. After questioning my age (“you must get that all the time”) she gave me and all those near me a free drink. It was great. At A’s house, things are a little more hectic than flying. Four children age 8 and under, who have been staying up later than normal and eating more sugar than they ought, are pretty crazy to be around. Sunday was pretty rough. A and I escaped to see Little Fockers that night though. It was good–maybe no so much as the first one, but definitely worth seeing. Unfortunately, they let ĥomoj in the theatre, so there were folks laughing at parts that weren’t funny and covering up funny bits with their loudness. ﻿Malŝatas. Speaking of movies, I never mentioned Tron: Legacy last week (I’ll blame exams and papers and all that nonsense). I enjoyed it, but I don’t know that I would have been able to get into it had I not seen the original film. Definitely watch that one first. Monday–after an earlier bedtime last night–was better. We played lots of wii (their Christmas present from the gradmas) and went iceskating. I have a new goal: learn to ice skate well enough to be able to help my children before my children are old enough to ice skate. Tuesday la patrino came in and Wednesday we trekked back home. Both nights I engaged in an abnormal-for-me activity: college football watching. I think the real reason I don’t watch it, is because I know I’d become entirely way too passionate. The game Tuesday night was the Insight Bowl. I was ready to argue with the refs through the television set (if you watched it, please agree that that catch was good–or at least not definitively enough otherwise to reverse the call). In case you can’t tell, I was cheering for MU. Thursday was a brief reunion along with a viewing of Toy Story 3. No tears this time, and it was nice to catch up with a few friends. I was also introduced to Millionaire Matchmaker. There are simply no words for how awkward it is. But can I stop watching? Not as easily as I’d like to be able to. So I had my first taste of this new security nonsense yesterday. At the ROC airport, there’s one dreaded new scanner, and the other lines use the normal metal detectors (well, actually I think there’s one of those air puffing scanners too, but whatever). Anyway, it seemed to me that the people who went in that line went through that scanner, and so I got into a different line. As I’m waiting for my bags to go through so that I could walk through the metal detector, the man asked me if I had anything in my pockets, then asked if I had a cell phone in my pocket. Well, when I’m asked two questions in rapid succession, especially if they’re yes/no questions with conflicting answers, I never know quite what to do. Here, I assumed he was wanting to know if I had left something metal in my pockets, since I was about to go to through the metal detector. No such luck. He was actually wanting to know if there was *anything* so that I could go through these new contraptions. I don’t have any real, strong feelings about them, besides economist!me knowing that they are wrong. Summary for those who don’t want to read: deadweight loss, increased car travel (which is, on average, more dangerous! ), and forced (non-market driven) participation. But I don’t feel like exposing my organs to more rays and such, which I don’t understand, any more than necessary. And little acts of rebellion make every feel better, right? So, I opted out. It’s quite clear that TSA does not want you to opt out. The worst, probably, was the chanting of “opt out” and the general grumbling in reaction to the decision. And of course, being felt up in public—not my cup of tea. But I plan to continue opting out for the remainder of my winter travels—sure I’m quite squeamish about uninvited touch, but if regardless of my choice, I’m being forced to buy services I don’t want—at the price of time, privacy, and dignity. If I have to bear extra costs, I’d like them to as well. I’m a customer of the airlines, not of TSA. The one good thing about flying, though, is that it gives me a chance to read. This time I read Neverwhere by Neil Gaiman. Mildly disturbing, but definitely a worthwhile read. Now I’m in Austin visiting a brother and his family. Unfortunately, I brought the clouds with me so I still haven’t got my vitamin D. The good news: delicious non-animal-containing and non-campus food. You know how it’s cold here ? (I’m going to assume you’re experiencing Rochester!cold or something similar. If you’re not, play along) Well, let’s just be glad we’re not in Russia. And extra glad to not be in the Russian army. Check out how ridiculous these uniforms are. Seriously, shouldn’t they think about the climate when designing uniforms? Speaking of ridiculous things that are also Russian, I’m really digging Soviet linguistics. It’s pretty crazy–think spontaneous generation level of crazy pseudoscience, but then put it in linguistics. I may look into more history of linguistics stuff later–and if I ever learn Russian, I’d like to read more of N. Ja. Marr’s stuff (I’ve been reading stuff other people wrote about his theories–I’m limited by my monobilingualism to English and Esperanto sources). Now, he wasn’t really *that* crazy. He was actually quite the expert on Caucasian languages (that ‘s languages of the Caucasus, in case you weren’t aware. At the time, there wasn’t much Western linguistic research in the area), but he drew really bizarre connections between languages and has odd theories about linguistic evolution. Apparently the research he did ended up pretty much useless because of his… unorthodox techniques (okay, I honestly didn’t quite catch what they were–something about acting like a paleontologist. If you have insight, let me in on it please?). He also thought all languages were converging into one communist language. Of course, it was pretty standard Marxism to think that the world was going to become all communist and at that point we’d be sharing a common tongue. I find it pretty fascinating that they also pretty much decided that it would be an artificial language–saying it had to be a natural language is like saying we should have waited for the steam engine to evolve on its own. Power of the hand and all that, I suppose. And now, back to paper writing. The next post I write will come from a less stressed version of me. Thank you so much to my wonderful, awesome, amazing friends who put up with me. Lately I’ve been thinking a lot about interpersonal relations. Reading psychology papers on the whys of friendship and the ilk. This semester I’ve done something I haven’t really managed before since starting this whole “college” things: had friendly discussion with people in my classes. Some of that was the nature of the course, I’m sure. The most interesting thing to me of late, though, is the interactions of recognizable non-acquaintances. For example, there’s man who sits at the same table almost every day next to this little coffee stand (is that even what you would call it? a coffee stand?). It’s also my favorite table for when I need to use an outlet, but normally there’s not competition for it because I use it at different times than he does. Yesterday, however, I’m sitting there and I notice that he’s sitting across the way on a bench, laptop plugged in and typing away. We share friendly eye contact, and I feel like a jerk for stealing his spot. We’ll probably never be friends, or even exchange names. But he’s definitely a part of my life. Anyway, I guess the point is that while it’s the people I call “friend” that I usually think of as affecting my life, it’s really the peripheral people who really form my day-to-day environment. Maybe I’ll work on making more of those people into something more like friendly acquaintances. I’m certainly not incapable of talking to strangers–like that Geneseo chick I shared breakfast with in O’Hare after we were both stranded overnight trying to get to Rochester. Or maybe I’ll just let them remain a comforting constant in my life. Well hello there, English speaking reader. Happy Esperanto Day! If you have managed to live your whole life without knowing what Esperanto day is (that is, if you were living under a rock last year this time), when us Esperanto speaking folk celebrate? Esperanto awesomeness on the birthday of Comrade Lenin Esperanto creator, LL Zamenhof. And in case you’re wondering about that strike out there, from my semester studying Stalinist!USSR, I’ve found some parallels between the attitudes towards Lenin and those towards Zamenhof. Those thoughts, unfortunately, will not make it into my epic paper, but I’d be happy to chat with you about that later. Preferably after I turn that paper in, and preferably over a drink (it’ll be more entertaining for you that way). So the highlight of the day was my econ review session… not. It was pretty much completely embarrassing since I made a *gasp* mistake. Oh yeah, and I think I should probably remind the professor of the ratio of non-native English speakers to native English speakers in his class. How do you explain “come out ahead” quickly and understandably? I can tell you how to explain it confusingly and ramblingly. 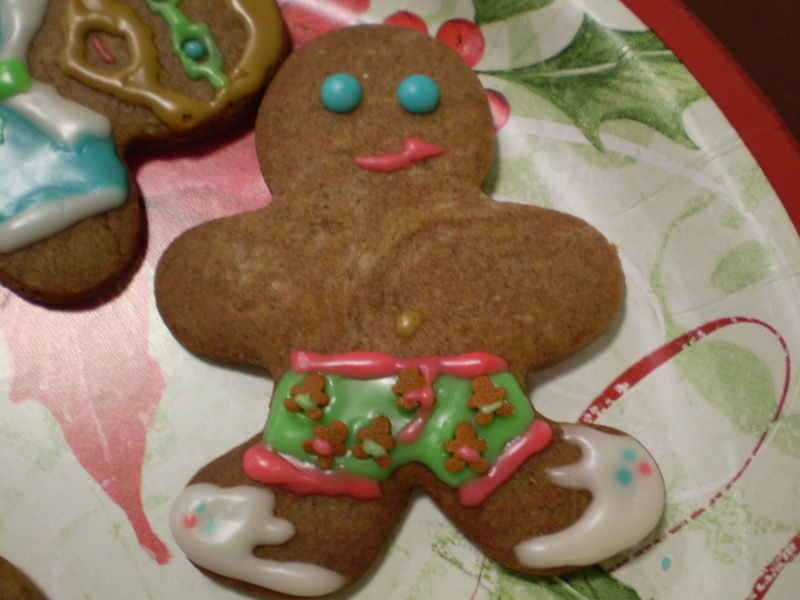 Yes, he is wearing gingerbread print undies. And bunny slippers. Next to him in the glasses is an Esperantist. He is not a native speaker of English. My questions posed in English are not always fully understood, and some of his explanations fall short. And he assumes that when we use French words that English has swiped, the words retained their French meaning. Ha. When questions are understood, it isn’t always clear why I’m asking them. Because teaching when to use the genitive is a lot different from just knowing when to use it. Which is something that is unrealistic at a basic level, but comes from knowing the tongue from birth. If you were ask me about English grammar rules, I could have told you freshman year of high school after Campbell’s English class, but since then, I can only tell you when things seem wrong or right. Same story with other folks and their languages. Free tea of poor quality tastes a hell of a lot better than that same tea if I were paying for it. With infrequent exception, I do not drink coffee after 3pm, unless I intend to pull an allnighter. So tonight I drank a cup of *sneer* lukewarm Lipton while not really really grading papers and not really writing a paper and generally avoiding the onset of stress. Then another cup. I have it in my mind that headphones full of Esperanto music is the same as getting work done on that Esperanto paper of mine, but I don’t think I can convince anyone else of that. But the good news? That tea was free. And it came in a library not swarming with loud, annoying people. Though there was a girl sitting behind me who brought her own desk lamp? Eh, I’ll take weird people over loud people. Hodiaŭ estis bonega tago… kial? Unue mi dormis multe. Poste, mi parolis kun mia frato. Li kaj mi bone rilatas kiam li loĝas pli ol 1.000 mejlojn for de mi. Post tio estis tagmanĝo kun la pli malpli ĉiam bonega K kaj aĉeto de ingrediencoj por la PKK-a Kristnaska Kuketa Festo. Pli pri tio kiam ĝi okazos, sendube. Kaj plej bone… Kristnaska muziko ĉe la kapelo. Mi kredas ke ne eblas malbone kanti Kristnaske. Tio estas bona afero por mi, ĉar kutime mi kantaĉas. Anoj de iu preĝejo kunportis multe da manĝaĵo por nia vespermanĝo, kaj bonŝance ili lernas pri vegana manĝaĵo kaj ĉi-jare estis iom. Nun mi devas fini korekti la hejmtaskojn de miaj studentoj por ke mi povus fari miajn taskojn poste. Q&A Time: Why not let languages die? num sola lingua bona est lingua mortua?